SUGAR, SPICE, AND EVERYTHING ICE?! It's the critically acclaimed ADVENTURE TIME™ spin-off starring our favorite gender-bent characters. It's up to Fionna and Cake to save the day from the Ice Queen, hopefully with the help of her friends Prince Gumball and Marshall Lee, this adventure will be a peace of cake! Ice Queen is creating havoc again when she decides to try out some of her wicked cool ice magic on some poor Fire Lions! 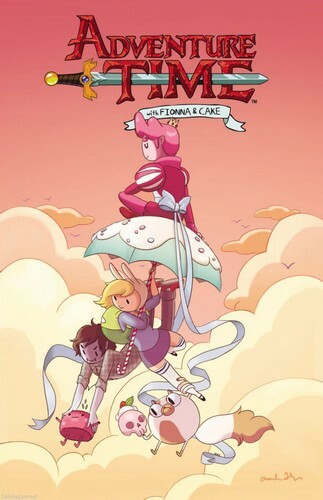 Fionna and Cake to the rescue, only they might be too late for their fiery prince! Will the be able to save Flame Prince in time, can they stop the Ice Queen from being so dang mean all the time, will Lumpy Space Prince find out the meaning of true beauty?! It's all collected in this trade, written and illustrated by animation sensation Natasha Allegri, and featuring short stories from amazing indie artist, including Lucy Knisley (STOP PAYING ATTENTION), and Kate Leth (KATE OR DIE!). Featuring a lush art style, and a fable-line storyline that appeals to young and old, and a perfect first comic for any kid in your life!